Georgia — the country — is not as well known to most middle-class Indians as the American state with the same name. However, it is gradually gaining attention around the world as a wonderful tourist destination. 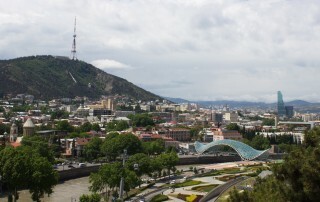 Its capital Tbilisi, for instance, has recently been cited as one of the most ‘happening cities’ in the world. A difficulty one might find with popular tourist destinations like Paris or Venice is the small evidence of a local population, so overwhelming is the tourist presence. This means that most places in Western Europe have turned themselves into theme parks and every sight seems only an elaborate facade. Actual conversations with ‘real people’ (rather than tourists) are not to be had and, when one does meet a local not tied to the tourist business, the response is typically cold. Also, these places are so exorbitant that sensible middle-class Indians rarely sit down to meals, subsisting on bread and cheese from supermarkets instead. Georgia is strikingly different in most of these aspects. One can still eat and drink wonderfully well at restaurants at less than $8 a meal; one sees many more locals than tourists on the streets and talks to ‘real people’, friendly and warm. When I wrote to a Tbilisi guesthouse to make a reservation, the owner somehow discovered I was a film critic, started a conversation about Satyajit Ray and sent me a short film of his to watch! Still, Tbilisi the capital scrapes only the surface of Georgia and one must perhaps get to Tusheti to see the country’s physical beauty — something which might have been possible in India through a road trip only forty years ago, before the growth story awakened the destructive tourist industry here. 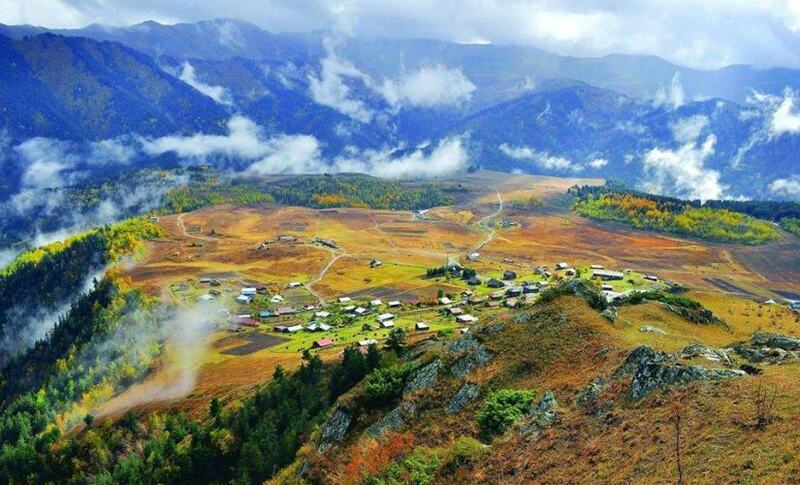 Tusheti is located on the northern slopes of the Greater Caucasus Mountains, bordered by the Russian republics of Chechnya and Dagestan to the north and east, respectively. The population of the area is mainly ethnic Georgians called Tushs or Tushetians. To get there from Tbilisi one needs to pass through Georgia’s chief wine-growing region Kakheti, take a treacherous dirt road through the mountains that can only be negotiated by smaller vehicles with four-wheel drives. This means there is no visible public transport to Tusheti and tourists need to rely on tour operators to take them there. Many people in Tbilisi expressed surprise that we had picked Tusheti for our trip since even adventurous tourists prefer the more frequented Svaneti in the north-west for their mountain excursions. 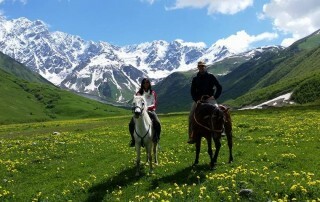 Mestia in Svaneti is connected by flight (lasting an hour) from Tbilisi while Tusheti is much more remote. Winter lasts from October to May in Tusheti and Tushetians come down to the lower regions from their mountain homes, including the shepherds with their sheep, goats and dogs. When we visited Tusheti in September many were already on their way down with their flocks. The tour operator we approached sent us a driver Gela and his wife Natalia, who is English-speaking, to act as guide and interpreter. Gela drives with the patience of a saint in the most difficult terrain while Natalia – who also teaches mathematics to high-school students – is an excellent conversationalist who was struck by how the two of us, whom they were escorting to Tusheti, spoke to each other in our own language in our casual talk but switched to English when discussing social, cultural or political issues. That made us think and we concluded that higher education had left us with only an English language vocabulary on certain subjects. In Georgia, all subjects are only taught in the local language, even at the higher levels. Our first stop on the way to Tusheti was at Telavi in the Kakheti region where Gela had to stock up on food. As we waited at the local gas station for Gela to return, the person in charge gestured to me to follow him behind a barricade. When I did so I found he had a plastic bottle with a transparent brown liquid in attendance, which he poured into a teacup. This nameless liquid was stronger than the standard Georgian Chacha (a grape Vodka) and had me gasping for breath. But he had a remedy waiting and he handed me a large slice of watermelon to consume, and all was well within a few moments. A whole watermelon waited for him (and the other wayfarers who might also sample the fiery liquid)! On the way to Tusheti is the Alaverdi Monastery of the Georgian Orthodox Church, which dates back to the 6th Century. The present-day cathedral was built in the 11th century by Kvirike III of Kakheti, replacing an older church of St George. Situated in the heart of the world’s oldest wine region, the monks also make their own wine, known as Alaverdi Monastery Cellar. The structure is splendidly atmospheric and its large grounds have grape and pomegranate orchards attached. The winding dirt road to Tusheti begins shortly after the monastery. The highest point on the dirt road to Tusheti is the Abano Pass from where vehicles start descending. Tusheti has a number of villages of which the largest is Omalo, where we were due to stay in one of the numerous guesthouses. Before reaching Omalo, however, Gela drove us to two other out-of-the-way villages Shenako and Diklo. Of the two I found Diklo particularly pretty since its structures are not crowded together as in some other villages and a grassy meadow reminiscent of Kashmir in its heyday marks its entrance. As in Kashmir, one sees horses or cows grazing in these meadows, until dusk brings them home. The village is fenced off and the few motor vehicles I saw were parked outside its gates. There are some wooden guesthouses in Diklo, one or two with quaint little kitchen gardens. The village is spotlessly clean, a feature also true of Omalo which obviously generates more garbage. 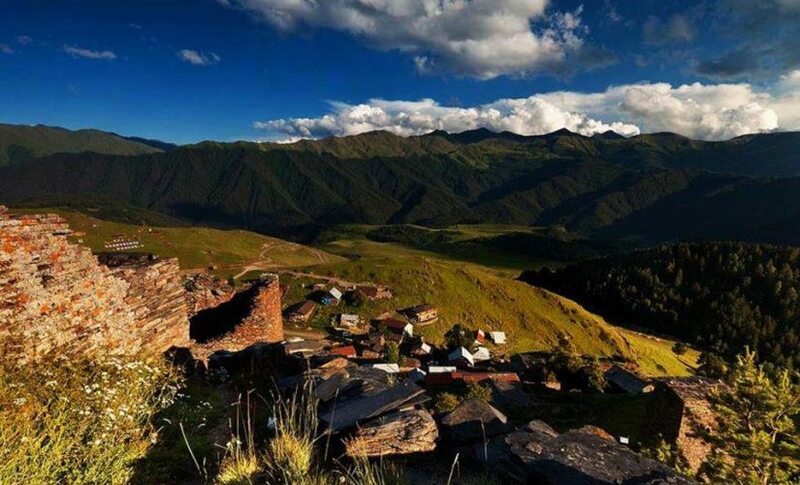 Tusheti is a protected area in which a large part is a designated national park and the area sees little ‘development’ in terms of construction activity. Tushetians have participated in wars since antiquity, including against the Persians and Tatars, and their villages have old stone watchtowers going back to the 17th and 18th centuries. Omalo, the largest of the villages, has four watchtowers looming over it. Our first day ended in Omalo in a guesthouse but we found the room so tiny that twin occupancy was virtually impossible; we had to, therefore, get an extra room for around $36 a night. It had been drizzling and compensation was the glorious rainbow over Omalo. The next day was reserved for visits to numerous Tushetian villages in distant areas along the Pirikita Alazani River – preceded, of course, by a sumptuous Tushetian breakfast of which the crowning part was the tiny apples (they could be mistaken for cherries) – pickled in syrup! The most important village we were to visit on the second day was Dartlo, which has a ruined church with a bell outside it and a circle of makeshift stone seats for the elders — who might be like our own sarpanchs and their associates — who judge people accused of wrongdoings, though by all accounts the highest punishment accorded by them is exile. From Dartlo, we were expected to hike to another village further up which I found impossible to do. But I did do part of the climb and proceeded to lie down on a slope, smelt the fragrant herbs around me and listened awhile to the crickets. There are one or two guesthouses in Dartlo as there are in neighbouring village of Chesho but not in the more distant ones like Dano, in which the residents in September seemed to number not more than a handful. Tushetians are Christians but in Dano we saw evidence of pagan practices still lingering – in the shape of animal skulls hung up on a bare brick structure. Another village was completely deserted since everyone had already left for their winter abode, most probably Alvani, Kakheti. 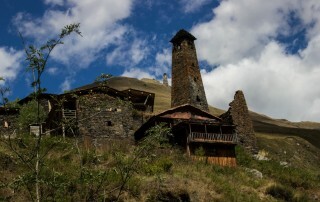 There are some signs of development in Tusheti and more comfortable hotels – better equipped than the tiny Omalo guesthouses – are coming up although they still cannot compete with the luxury that tourists are accustomed to. But for those who wish to see the world as it once was, before conspicuous consumption drove it whence it cannot return to peace and tranquility, Tusheti can be unforgettable. MK Raghavendra is a film scholar and author of seven books including The Oxford India Short Introduction to Bollywood (2016). He is deeply interested in social, political and cultural issues in India, an interest that informs his books on film. He also loves to travel to little-known places.